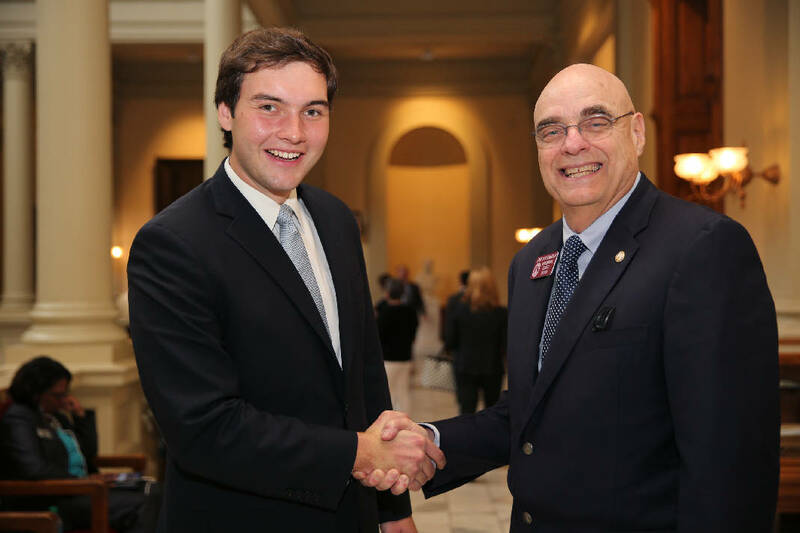 Colton Moore poses for a photo with State Rep. John Deffenbaugh, R-Lookout Mountain, Thursday, March 29, 2018 at the Georgia State Capitol in Atlanta, Ga. Deffenbaugh invited Moore, his 24-year-old opponent in the upcoming election, to the Capitol building, so Moore could gain first-hand knowledge about the job of serving as a State Representative. TRENTON, Ga. — During a debate Thursday night, state Rep. John Deffenbaugh defended keeping a tax break referendum off the ballot. Deffenbaugh said local school officials had not properly thought through a plan to cut the "65 and 5" property tax exemption. Under the policy, residents over 65 years old do not have to pay school property taxes on up to 5 acres of land. He said he was against the plan because Dade County Schools officials did not tell him how the plan would compare with surrounding counties. He believes the rules should be the same for neighboring governments. In Walker County, residents see property tax exemptions at 70 years old, when $50,000 of the assessed value for their home is not counted in the calcuation of their tax bill. At 75, if the residents and their spouses make less than $15,000 a year, they don't have to pay any taxes, up to 5 acres. The exemptions don't include outbuildings, such as a garage separate from a house. Even if the school system's plan to cut the tax exemption went on the ballot, Deffenbaugh said, voters would have rejected it. To put a referendum on the ballot, a county's local representatives have to pass a local act in the Legislature. "I could have said, 'Yes, we're going to put that on the bill and put it up there to vote,'" Deffenbaugh said during the debate at the Dade County Public Library. "It would have failed. What would that have accomplished? I asked them to figure out what the community was doing around them, what the counties were doing, come up with something. And then I would present it. And that still stands. I haven't heard from them." Deffenbaugh, who has been in office since 2013, will face 24-year-old Colton Moore in the May 22 Republican primary. There is no Democratic candidate in the race. During the debate, Moore said he supports reworking the county's "65 and 5" exemption. He believes wealthy people have moved to the county and can afford to support the school system. He thinks the system could create another clause in the plan, requiring taxpayers to live in the county for five years before qualifying for the exemption. "We're picking winners and losers here," he said. "And right now, the losers are people like me and the people who have families who are paying this tax. And the people who are winners are the people who come in. We're not just a retirement community." Former schools Superintendent Shawn Tobin said he asked Deffenbaugh to put a referendum on the ballot about five years ago. He said Deffenbaugh initially supported the plan. The next time they talked, Deffenbaugh had a change of heart. "He said he wasn't going to do it," Tobin recalled to the Times Free Press last week. "[He told me,] 'I never said I was going to do it.' And I was like, 'Yeah, you did. We talked on the phone.'" Tobin doesn't remember exactly when this happened. He suspected 2013. He left the school system in 2014. Asked if he originally committed to putting the item on the ballot, Deffenbaugh said Friday that he couldn't remember the details. During the debate, Deffenbaugh touted the legislature's education actions. In particular, the lawmakers passed a budget to fully fund Quality Basic Education, a formula that dictates how much the state gives local school systems. The formula looks at several factors, including the number of students, the number of teachers and how many special programs a system needs, such as English classes for immigrant students. Deffenbaugh told the crowd that the state created the formula in the 1960s, and it had never been fully funded until now. In fact, according to the Georgia Department of Education, the state created the formula in 1985. It was last fully funded in 2002. Based on what the formula says schools should receive, the state underfunded schools by $167 million before the new budget. In Dade County, Superintendent Jan Harris said, the state will give the system $220,000 more than it did last year. Deffenbaugh also pointed out that the legislature is trying to eliminate some standardized testing. The lawmakers passed a bill that created an experimental program; some districts will be able to temporarily replace state standardized tests with local tests. Moore opposes the number of standardized tests students take, as well as the way Georgia teachers are evaluated. In the Teacher Keys Effectiveness System, at least half of a teacher's grade is based on student achievement. Moore believes a set-up like that strips teachers of freedom. He cited a Georgia Department of Education survey in which 66 percent of teachers said they were unlikely to recommend the profession to graduating students. The survey polled 53,000 teachers in 2015. Both candidates believe local school boards should be allowed to decide whether teachers can carry guns in the classroom.